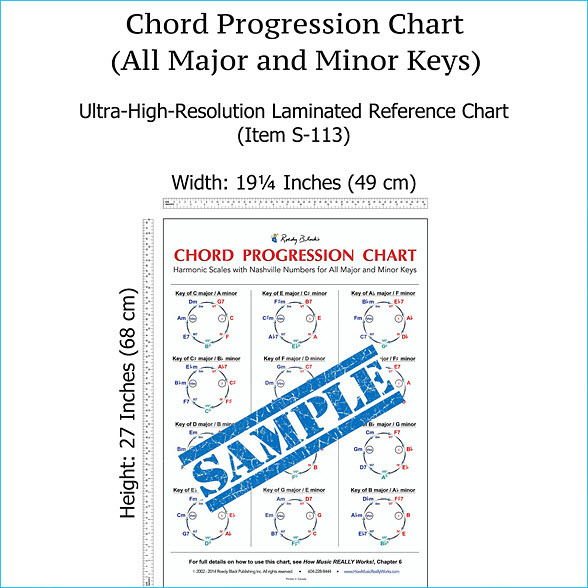 The Chord Progression Chart shows the harmonic scales and Nashville Numbers for all major and minor keys. The Nashville Numbers around the inside of each circle remain constant while the chords around the outside change according to the specific key. The Chord Progression Chart will save you tons of time and tedious effort, especially when you want to get creative with variant chords and modulations to other keys. For complete explanations of harmonic scales and Nashville Numbers, consult How Music REALLY Works!, 2nd Edition, which covers these topics in detail, with many examples. � and  1987 - 2019 Roedy Black Publishing Inc. All rights reserved.